A Quiet Place 2 is currently in development and producer Andrew Form says that John Krasinski is "definitely involved" in the sequel. This is promising news for fans of the first installment who have been wondering about new details. 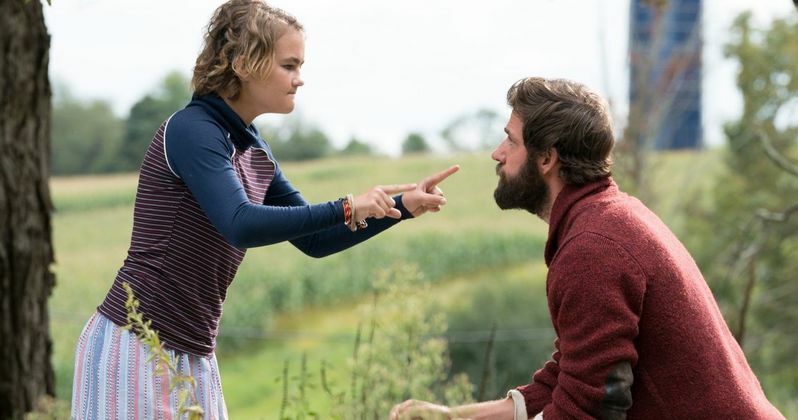 A Quiet Place was a surprise hit, earning over $328 million worldwide and talks of a sequel began shortly after its theatrical debut. The horror drama will be released on Blu-ray on July 10th and is currently available to stream digitally. In a new interview with Collider, producer Andrew Form discussed A Quiet Place 2. While the sequel is now in development, it could be awhile before it hits theaters, according to Form, who noted that they will be taking their time to make sure that everything is done correctly. Additionally, the producer says that John Krasinski will be involved, which is pretty big news. Everybody involved is waiting for the "right" story to come along to ensure that the sequel is the best that it can be. Form explains. "It's such a special movie to us, the experience and everything. It's easy to rush these and we've made movies in the past where we've rushed them through and we've felt it, and we just don't wanna do it on this one. We really don't. We really just wanna take our time and as long as it takes, it takes. It has to be the right story, just like the first one. It just has to be." There's a lot of ways that A Quiet Place 2 could go and it could end up turning into an anthology series in the future where all of the sequels take place within the same world. For now, it's too soon to try and figure out what the team will decide to do with the next movie, but they certainly have some big shoes to fill after the breakout success of the first movie. The pressure will be on put out something that is either better or as good as A Quiet Place, which will not be easy to pull off. Though John Krasinski will be involved in the development of A Quiet Place 2, he more than likely will not star in the film after his storyline in the first movie. Krasinski could star as a different character or even as the same character in a prequel-type scenario. The actor has publicly discussed the idea of a sequel and brought up the idea of A Quiet Place 2 focusing on the other survivors from the first movie. However, nothing has been officially confirmed at this time in terms of the focal point of the plot. It's going to be a while before we end up seeing A Quiet Place 2, but that's a good thing. The team are taking their time to make sure that they don't regret putting out a sequel. Fans of the first movie are anxiously awaiting any news in regard to the project and it seems like it will be a while before we hear about anything else until there's a solid story in place, which could take some time. While we wait for more news, head over to Collider to read the rest of the interview with A Quiet Place 2 producer Andrew Form.